Got some thousands of dollars to spend like Donald Trump does? 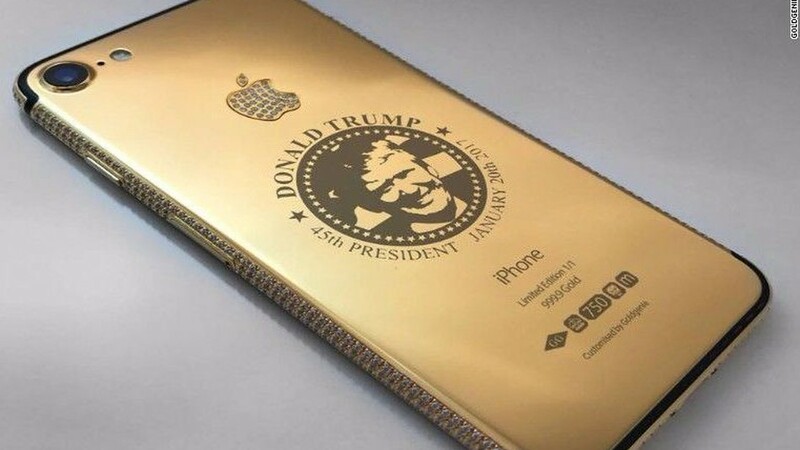 Well here's a perfect suggestion for you; a gold-encased, diamond-encrusted iPhone 7 with the president-elect's face on it. Yes, this completely unnecessary and truly bizarre item is being created and sold by Goldgenie, a store in the United Arab Emirates for about $151,000. Why?! Well, that's an excellent question. The store in Sharjah, a city near Dubai, decided to sell the Trump iPhones after a customer personally requested the design last month. Emirates 24/7, a Dubai news publication, explained the golden device was embellished with over 450 VS1 white diamonds within the Apple logo and around the phone's edges. CNN Money reported that Goldgenie's managing director, Frank Fernando, described ideal owners of the blinged-out mobile devices as, "very wealthy, high-net-worth individuals all over the world," who are hard to shop for because they already have everything. Fernando said he believes the family of the Chinese woman who requested the president-elect's features be put on her phone wants to give it to Trump after his inauguration. Since selling its first Trump iPhone, Goldgenie has reportedly received nine additional orders for the statement-making devices. From the looks of the gold-drenched Trump Tower, it's clear that Trump loves extravagance. This iPhone design suits him, and it could be yours for a very reasonable price. Real iPhone 7 encased in solid gold encrusted with diamonds & face of Donald #Trump Not that normal citzns can afford it but hey you chose him! Even though the price looks a bit extreme, the regular iphone colors of black, jet black, rose gold and silver are suddenly not looking so impressive, are they? Tell us your opinions via comments.